Coined by academics Martijn Cremers and Antti Petajisto in 2009, active share is a well-established yardstick in the world of equity investing. Beyond funds of stocks and shares, however, this measure is yet to be applied more broadly, enabling closet trackers to remain under the radar in areas such as high-yield credit. In the decade since its introduction, active share has earned its seat at the table alongside tracking error, volatility and the information ratio, which in concert help to identify the extent to which active fees are being put to work. Active share measures how much a portfolio of stocks differs from a benchmark, empirically distinguishing how active a manager really is. The measure ranges from zero to 100%, with zero considered to be equivalent to a passive or index-tracking fund, while 100% is a totally active fund, in which all positions differ from those in the benchmark. Messrs. Cremers and Petajisto concluded that an actively managed fund's active share typically falls within the 60% to 80% range. Active share is viewed as a good predictor of fund performance relative to the benchmark. Funds with the lowest active share tend to underperform their benchmarks, while those with the highest tend to outperform. Beyond the measure's relative newness, a lack of transparent data, historically, has restricted the application of active share to other asset classes, such as high-yield credit, where track records tend to be much more limited relative to equities. Before passive high-yield credit funds were demanded by retail investors, high-yield managers were insulated from scrutiny of their active characteristics, but the proliferation of passive high-yield vehicles has provided a wealth of data, enabling the application of active share in a credit context. Figure 1 shows the distribution of active share for the global high-yield credit funds in the Morningstar EAA OE Global High Yield – EUR Hedged universe, which consists of 93 funds. The distribution shows that the data is normally distributed about its mean of 46.71%, with a slight negative skew. We can see that most global high-yield credit funds' active shares are from 43% to 50%. In 2016, Mr. Cremers recalibrated his definition of an active portfolio, viewing all portfolios as perfectly active (100% active share) and making reductions according to the overlapping positions between the benchmark and portfolio, rather than taking a portfolio as being perfectly passive and increasing its active share by adding the absolute and relative excess weights between the portfolio and benchmark. Under this format, most global high-yield credit funds' active shares are 90% to 99%. 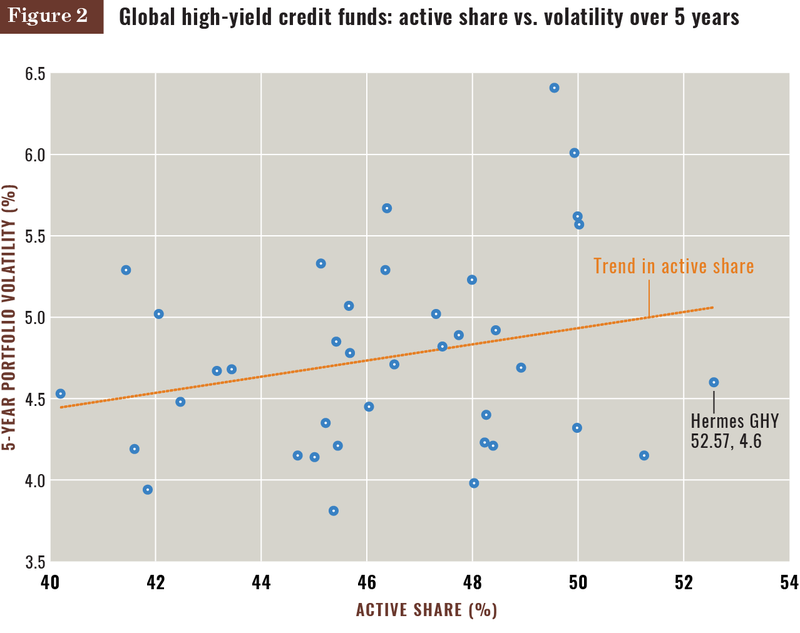 Figure 2 shows the relationship between global high-yield funds' active share and their volatility. Though the data set is well dispersed, it shows that if a fund increases its active share, a deviation in its volatility is probable, reflecting the potential for outperformance. Keeping everything else constant, an investor could use active share to quantify a probability for the expected volatility of a high-yield fund to help inform their decisions. Mr. Cremers' theory found that active share and tracking error can be used to identify different styles of active management and we considered the link between the two metrics in global high-yield credit funds; we found the link to hold true within high-yield credit. From an investor's viewpoint, identifying a manager's style more accurately means the investor can make informed decisions about that manager as well as the fund itself. This additional metric can improve an investor's ability to allocate to funds with a higher likelihood of gaining the precise exposure they seek. Investors rarely use active share as a stand-alone statistic to select funds. It therefore may be useful to analyze the relationship between active share and various other statistics to see if there is a correlation between them. 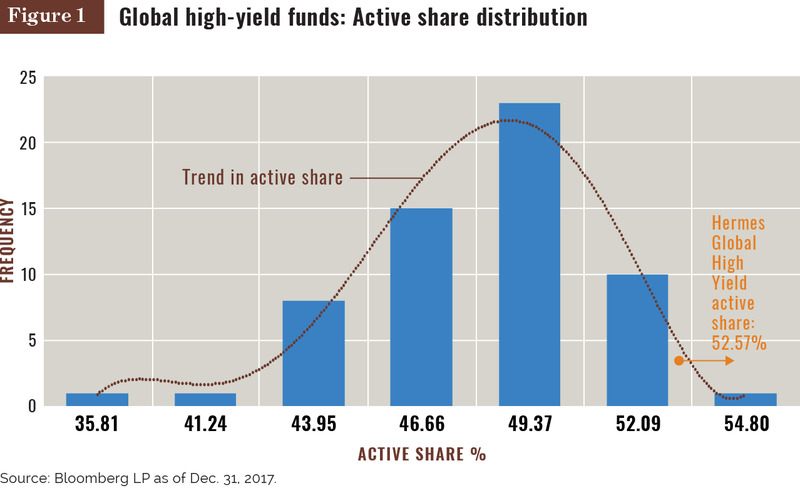 We also analyzed the link between global high-yield funds' active share and their relative returns. While the active return for equities is confined by a continuous probability distribution, this is not the case for global high yield. The data points demonstrate some resistance, a result perhaps of the current low-interest-rate backdrop. Although rates are now increasing gradually, this isn't in the best interests of yield-hungry investors. What's more, monetary returns derived from fixed income are more predictable than those of equities, resulting in a lower tracking error. That said, investors can use this measure to gauge the potential path of future returns, depending on how active a manager may be. This allows investors to control expectations and plan for the future accordingly. Finally, we considered the link between active share and the volume of assets under management in a fund. Research shows that as AUM increases beyond €100 million ($114 million), the active share of funds becomes more dispersed. Though factors such as management style and investment objectives will influence this output, many larger funds previously gained favorable access to primary deals. Now, as the wider scope of credit mandates become more desirable to investors, active share metrics are being demanded by asset allocators (who themselves are fighting hard to prove that they add value), resulting in a broader distribution of bond issuance among investors. By comparing a credit fund's active share with its volatility, investors can take a first step toward determining a probability for its expected volatility. Further analysis of active share and tracking error shows the management style driving a fund. Finally, comparison of active share and relative return enables investors to gauge a potential range for future returns, depending on how “active” a manager really is. In concert, these reference points provide investors with a more complete picture on which to base their expectations and adjust their plans accordingly. In a competitive market for investment products, the clear application and development of active share as a key reference metric will equip investors with another crucial tool to identify truly active management. Indeed, while there is no automatic, causal link between high active share and outperformance, the former is a necessary precondition for achieving the latter. Eoin Murray is head of investment and Tarandeep Panesar is performance analyst at Hermes Investment Management, London. This content represents the views of the authors. It was submitted and edited under P&I guidelines but is not a product of P&I's editorial team.